Children on bus from Ma'ale Hazeitim suffer harrowing experience as masked Arab terrorists hurl dozens of potentially lethal rocks at them. A bus carrying young children from the eastern Jerusalem neighborhood of Ma'ale Hazeitim, located on the Mount of Olives, to their school located more centrally in the capital city came under a barrage of rocks Monday morning. Masked Arab terrorists hurled dozens of the potentially lethal rocks at the bus and the children inside, but fortunately none were wounded in the fusillade. Damage was caused to the windshield of the bus however. 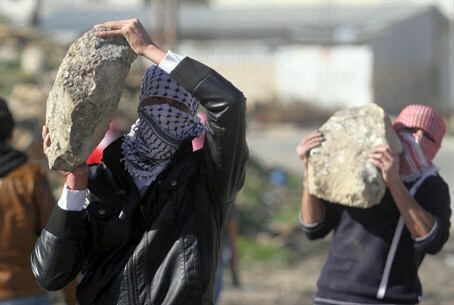 The attack is part of an ongoing wave of rock attacks on roads throughout eastern Jerusalem, Judea and Samaria. While the Arab attacks continue on a near daily basis, only a small portion of the attacks are reported on in the mainstream media as most instances only involve damage to property. Ma'ale Hazeitim has seen Arab terrorist attacks on a constant basis; last September a day care center in the neighborhood came under assault by Arabs hurling rocks and fireworks at the terrified children. The home of Jerusalem Councilman Arieh King, who lives in Ma'ale Hazeitim, has been attacked no less than 52 times with rocks, firebombs and even bullets, with police failing to take significant action to curb the attacks. After the 52nd attack, King was forced to arrange private patrols to try and secure the neighborhood in Israel's capital. The attack on the bus this Monday comes after an ambulance was shot at on Saturday night along a road adjacent to Beit El in the Binyamin region of Samaria, north of Jerusalem.